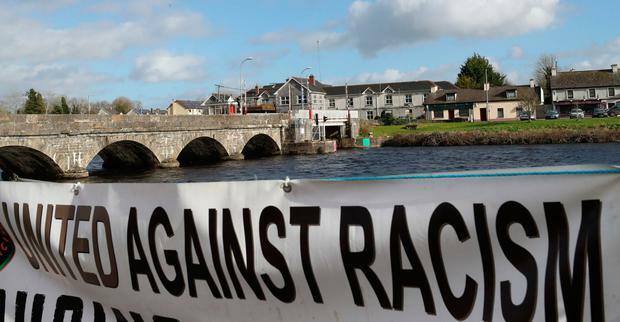 As the Department of Justice pleads "legal difficulties" for not going ahead with a Refugee Reception Centre in the village of Rooskey, the sorry truth is that the racist fire-bombers have succeeded. They have driven the State away with two arson attacks and made the village on the borders of Leitrim and Roscommon a 'no-go' area. Through all the years of IRA violence, the government refused to give in to threats and intimidation. But in the face of vandalism it has buckled with yesterday's announcement that plans for the asylum centre will not go ahead. "Local people are by no means racist," said the Fianna Fáil TD for the area Eugene Murphy - and, of course, that is almost certainly the case for the majority of people living there. But somebody is not only racist, but prepared to commit criminal damage and put life at risk in pursuit of their twisted ideology. The fire-bombings were deliberately planned and targeted the former hotel at the bridge that leads across the Shannon into the village. When it opened first, the hotel, then called the Shalamar, was an exciting new development catering for tourists visiting Ireland's 'lakeland' counties for fishing and other leisure activities. Back then, the local TD was Albert Reynolds, who came from that little corner where the three counties meet and was sometimes referred to as "a blow-in" by opponents in Longford County Council. Rooskey used to be a vibrant village with Hanley's Bacon factory, the Crews Inn pub a well-known staging post for boats cruising along the river coming and going from Carrick-on-Shannon, and the Cloudland, bursting with dancers from all over the midlands, the local 'ballroom of romance'. But the romance has long faded, the factory closed in 2002 and the Shannon Key West hotel closed its doors in 2011 at the height of the recession. So what has anyone to fear from 82 refugees occupying an empty building? These people might have brought back some life and vibrancy to what has now become a drab corner of the midlands, bypassed by the Dublin/Sligo road. People complain about rural Ireland closing down - but when someone proposes to bring new people in, their prospective accommodation is fire-bombed. Once might have been unfortunate, twice was a very deliberate and provocative message that refugees were not wanted. It isn't just Rooskey. The same thing happened in the Caiseal Hotel in Moville, Co Donegal, which was extensively damaged in an arson attack. Locals can argue that there wasn't "proper consultation" before the plans were announced, but we all know how even the best-laid plans get held up indefinitely when anything new is proposed. The only objective conclusion is that racism is more rampant than we like to imagine. We want more people in rural Ireland, but only a certain sort of people. It is also interesting to contrast what has happened in Rooskey and Moville with the reception a group of Syrian refugees got when they came to Ballaghaderreen, Co Roscommon. Local people went out of their way to welcome them, to be helpful, to cater for them - and they were rewarded when their welcome was reciprocated with gratitude. Not so far away, the name of Rooskey has been sullied because somebody has taken the law into their own hands, and sad to say they have won. "Legal difficulties" over the lease have now arisen between the owners of the former hotel and the operator, leading to the Department of Justice cancelling its plans. While there is absolutely no suggestion either party is in any way responsible for the arson attacks or racism, the outcome is hugely disappointing for all. But the real loser is Rooskey, which will settle back into undeserved obscurity when the present controversy fades away.